How to choose Referral Partner — How do you want to track which referral partner gets credit — by first referring or latest referring? There’s really no right or wrong answer and an argument can be made for both sides. The first-referring partner introduced you to their audience. Even if the person didn’t buy at the time, your first-referring partner warmed them up for the last referring. The latest referring, of course, was the person who hit the homerun and made the sale. Whichever you choose, make sure your Referral Partners know. Referral Partner tracking method — Your options are “Only cookies” or “Referral history and cookies”. Cookies are small files stored on our computers. A cookie gets put on the computer when someone clicks a referral link. That cookie stays there until the user clears cookies or it expires. If your referrals come only through online marketing, then it’s okay to use “Only cookies”. But if you have referrals that come to you through phone calls or emails, then you’ll want to use “Referral history and cookies”. 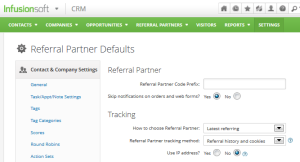 Also, when you create a Referral Partner sign up form, you can set cookies to expire after a certain number of days. If you want cookies to be only good for 30, 60, 90 days, then don’t set the IP address to yes. Questions about creating a Referral Partner program? Click here to schedule a call.